In this paper, we present a highly data-driven approach to the task of single image super-resolution. Super-resolution is a challenging problem due to its massively under-constrained nature - for any low-resolution input there are numerous high-resolution possibilities. Our key observation is that, even with extremely low-res input images, we can use global scene descriptors and Internet-scale image databases to find similar scenes which provide ideal example textures to constrain the image upsampling problem. We quantitatively show that the statistics of scene matches are more predictive than internal image statistics for the super-resolution task. Finally, we build on recent patch-based texture transfer techniques to hallucinate texture detail and compare our super-resolution with other recent methods. Libin Sun, James Hays. Super-resolution from Internet-scale Scene Matching. Proceedings of the IEEE Conf. on International Conference on Computational Photography (ICCP), 2012.
test set (low-res input), 80 images, 2.0MB. test set (high-res ground truth), 80 images, 9.8MB. scene matches (high-res), 80 x 20 = 1600 images, 322.8MB. 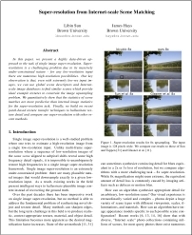 We make comparisons to (1) bicubic interpolation, (2) Sun et al [CVPR 2010] and (3) Glasner et al [ICCV 2009]. Comments, questions to Libin Sun.